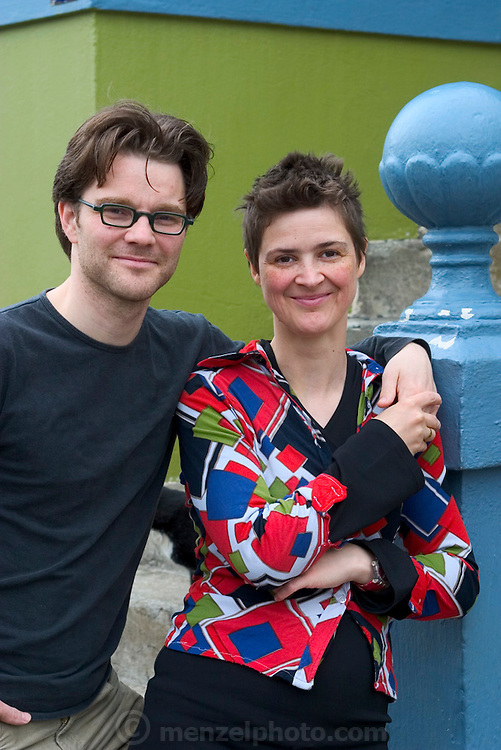 Icelandic sculptor Ilmur Stefnsdottir and her partner, the actor Valur Freyr Einarsson. Ilmur, pregnant with her fourth child, is experimenting with a piece of her performance art; focusing on the connection between people and objects and using common objects in an uncommon fashion. "People misunderstand objects in their environment," she says, "I'm exploring visually how this happens." Valur occasionally acts in performances that center on his partner's artworks; most recently in a show called Common Nonsense that they and a troupe of actors performed in Reykjavik, Stockholm, and London. MODEL RELEASED.